Product prices and availability are accurate as of 2019-04-20 02:02:02 UTC and are subject to change. Any price and availability information displayed on http://www.amazon.com/ at the time of purchase will apply to the purchase of this product. 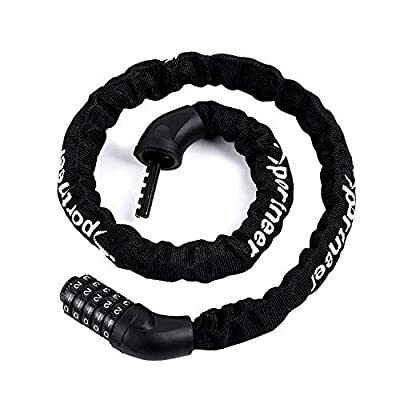 KEYLESS SECURE LOCK MECHANISM: This bike chain lock has advanced 5-digit combination lock, allowing up to 100,000 possible codes making it nearly impossible to crack. Keyless convenience. DURABLE CUT RESISTANCE CABLE: This bike lock cable is made from 0.27 inch extra thick manganese steel for cut resistance and protective zinc-plated coating to prevent from scratching. EASY TO SET/RESET: Easy to set and reset your own personalized number combination. LONG FLEXIBLE CABLE: This bike lock is 3.2 feet long, ideal for bicycles, bike, ladders, lawnmowers, gates, fences, tool boxes, bbq, sport equipments and etc. WATERPROOF & DUSTPROOF COVER: A flexible cloth sleeve which covers the chains to protect it from being scratched and sawed, long lifespan.